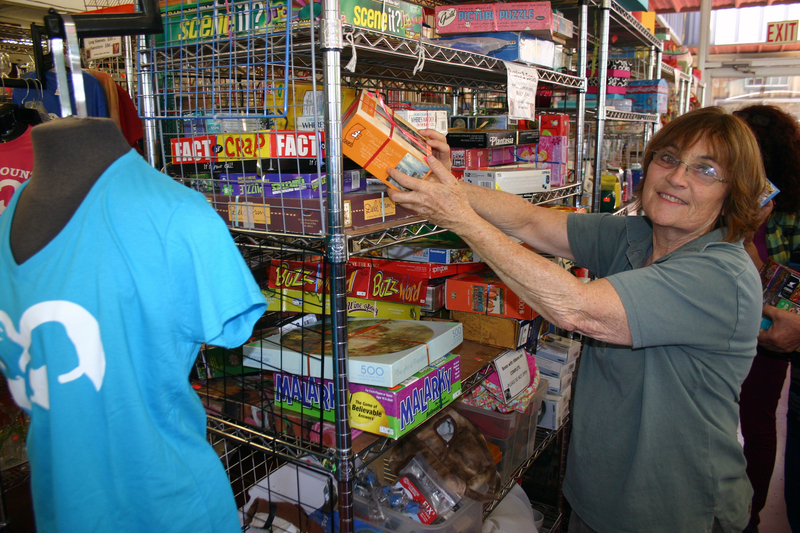 Lea Rosenberg sorts puzzles on June 5 at the Yolo County SPCA Thrift Store in Davis. Leaders in the nonprofit sector agree, if it wasn’t for the support of Davis’ active adults, things wouldn’t be the same. Davis residents 55 and older contribute more time and money to area charities than those who are younger or in surrounding communities. Highly educated and filled with life experiences, they also provide thoughtful and valuable insight. “They’re the backbone of our support,” said Ray Bautista, who coordinates more than 600 volunteers for the Yolo County Food Bank, which distributes more than 4 million pounds of groceries to those in need. “Seventy to 80 percent of our long-term volunteers — meaning six months or more — are over 55. They are the ones who stick around and provide consistent support on a regular basis,” Bautista said. Tracy Fauver, executive director of Yolo County CASA (Court-Appointed Special Advocates for children), echoed that sentiment. Of the organization’s 135 volunteers, 50 of them are 55 or older. Specially trained volunteers advocate for abused and neglected children in the foster system. However, many active adults who want to stay in Davis are frustrated by the limited housing options, especially if they want a quiet, single-story, ADA-accessible home. Most housing in town is geared toward college students or young families. “If we don’t plan ahead to ensure housing for those active adults, we could lose this precious resource of time, talent and treasure,” said Dave Taormino, a longtime Davis real estate developer and proponent of the West Davis Active Adult Community. Lea Rosenberg, 70, volunteers extensively with the Yolo County SPCA and Sutter Davis Foundation board. An active member of Soroptimist International of Davis, the Davis Odd Fellows and Rebekahs, and University Farm Circle, she was named Volunteer of the Year by The Davis Enterprise three times, and Davis Citizen of the Year in 1991. Previous : Will Police Need a Warrant for Cell Phone Data? Shouldn’t paid ads be labeled as ads? That’s two in the last week. They didn’t pay for it. Like I said last time, I think these are valuable even though you know that it’s coming directly from the developer. Yeah, they’re valuable for the developer. It’s important for the community to understand the project and to understand the perspective of the developers. Them getting these out early will facilitate that. So I think it’s a good thing. I think the readers here are smart enough to parse the articles and ask important questions and raise potential objections. I see more information as a good thing – not a bad thing. So any business can get a few residents involved to present a local angle then advertise their goods on the Vanguard for free? Generally speaking the Vanguard has an open submission policy. Although, we generally require a public policy angle. David, I’ve noticed that you often list notices and some releases on the back pages of your blog. How does this advertisement qualify for a front page view? 1. — Will active adults with current ties to Davis actually make the decision to move from their current residence to one of these residences? The existence of active adults in a community, and the high level of activities they participate in the community does not necessarily translate into a willingness to make the financial decision to change their residence. Bottom-line, this article talks about theoretical demand for the housing proposed, but it doesn’t address the issue of whether theory will become actuality. If there isn’t actual demand, then the residences will end up being sold to people who aren’t currently part of the Davis community. 2. — The land use footprint of this proposal is very inefficient. The senior community at URC is three stories tall. That means each acre of land in the complex supports three times as many seniors as this proposal. As a prior critic of the DV not listing bios or author identification for articles, I am glad to see ‘press release’ associated with this article however I think it would be more informative to allow readers to evaluate content to list the identity of the press releases when the DV published them. What do you think? Agree. I personally would support the statement of press release + the identity of the sponsor of that release. I do not believe that it is necessary to label as advertising. I concur with Dianne’s suggestion. I’m fine with doing that. Advertising implies we got paid for it, so I won’t label it as such unless we did. But I will have more of a label at the bottom. I then experienced the involuntary regurgitation of a small portion of last night’s dinner. BTW, there is no author listed. All it says is “press release”. It has to be press-released from someone, or some organization. Given that it is a thinly-veiled ad disguised as a public-interest story, it should at least have the name of the organization that released it. Or did God himself do it? What is an “active adult”? What adults does this exclude? Are the housing needs of non-active(?) adults less of a priority? Active adults apparently want “quiet [meaning families with children and students are not welcome], single-story ADA-accessible housing.” Are there not younger adults and other families who want and need the same features? Affordable housing and accessible housing are in short supply throughout the community–even for those who don’t have as much time to do volunteer work with nonprofits. Segregated, exclusionary housing is not the way to address those needs. My understanding is that active adult is an age-restricted community for older people that are able to care for themselves. A proponent allright, he also happens to be the developer of the proposed project. These articles will of course include interviews with charming local residents in each of these groups, who support more housing for themselves and others like them.
. . . as built by Dave Taormino. I’ll look forward to the aging in place turkey interviews on the front page of the Vanguard. I I’ll support this if it means redeveloping Rancho Yolo for all people. We have way too much of the city footprint dedicated to exclusionary housing now. Not aesthetic, but serves a need… a critical need. Why so much hate on Rancho Yolo? I noticed this from you in the Sterling discussions as well. Do you not like trailers in Davis? It’s 40 acres for just a few people. Also I do not like the walled city aspect with no bike paths through. Rancho Yolo is a fantastic community that fills a real need in Davis. The Escalade is a fantastic vehicle that fills a real need as well. It’s also hugely inefficient and seems out of place in an environmentally friendly community. Seems hard to advocate for both climate change action and Rancho Yolo. I don’t like walled cities much either. It’s certainly not the only place in Davis with a poorly-though-out bike circulation pattern (I could name a few places) as far as citywide biking. I’m curious how the density really is compared to an outlying Davis suburb, as trailers don’t take up much of a footprint. What it does do is provide actual low-income housing that people can afford to live in, rather than the “Affordable Housing” government subsidy/quota game that creates all sorts of inequity/inefficiency. I find it so odd those that wish to dispose of low-income housing and replace it with Low-Income Housing. Actually, it makes total sense when you “follow the money”. A tumor? Again, this seems a bit hateful. I am amazed on this blog the number of times that comments are made by certain commenters that basically say, “I don’t like your neighborhood — it should be changed / eliminated into something I think is better”. The Rancho Yolo crowd does not seem to be shy about showing up at the council and complaining that someone may ride a bike down 5th which would impair their quality of life. Jim: You dislike El Macero or Binning on the same grounds? And your reaction is they need to be wiped off the map? Both are peripheral and I barely notice them. I would for advocate for moving the city yards on 5th next to the Binning tract. There would likely be remediation problems on the city yard though it would make excellent housing. Both locations share a path through downtown to the university. If Ranch Yolo was ‘redeveloped’ (maybe a 0.01% chance) it should be mitigated by a 3:1 replacement elsewhere in Davis City limits, as they exist. Next to similar transit lines. We have ‘stacked parking’ now, can we have ‘stacked trailer parks’? That would eliminate the ‘inefficient use of land’ argument! I believe the planning number for three story is 100 Units/Acre. This is with parking. At RY that would be 4,000 units. parking levels. Concrete podiums are the most common, though steel podiums also exist. Although not considered ‘podiums’ under the IBC, using a heavy timber system to separate parking from light wood-frame residential units above is also gaining popularity. The upper slab of a concrete podium typically acts as both a fire separation and structural transfer slab for the framing above. If built using the special provisions of IBC 510.2, this construction approach allows increased density with additional stories, maximizing the use of smaller urban lots while benefitting from wood-frame cost and speed of construction advantages. Common configurations include four or five stories of residential use over retail, commercial, office and/or parking, and six or even seven stories of residential use, including the podium level(s), with subterranean parking. According to Tim Smith, four stories of residential occupancy over a non-residential podium will achieve densities similar to wrap-around. With five stories of residential units, density can increase to 100 to 120 units per acre. An additional 20 units per acre are achievable when the podium levels include residential occupancy. “specified 3 stories” Howard, you are correct. Though I am counting less parking than they include and smaller units. Can we agree on 75 with lower than usual parking. Alan: “Actually, it makes total sense when you “follow the money”. I vaguely have no idea what you are referring to.